I met with my 79 year old cousin, Ruth, in hopes of gathering information about my maternal great-grandparents Lucy and Henry Bundy. Ruth is my first cousin once removed and one of Lucy and Edward’s many descendants. I’ve mentioned the size of the Hendrick family but I should tell you that the Bundy family is rather large in it’s own right. Edward and Lucy had eight children: Edward, Naomi, Andrew, Rosie, Lucille, Floyd, Edna and Henry. Ruth’s mother, Naomi, and my granddaughter, Henry, were siblings. As the youngest granddaughter, my mother is nearly 25 years younger than Ruth and the two were never very close; therefore, my mother’s older sister contacted Ruth and explained the premise of my work. Together, my mother and I drove to our cousin’s home, eager to learn more about our ancestors and a bit nervous to meet a woman who we hadn’t seen in years and heard was quite a character in her day. We were greeted by a petite woman with cocoa brown skin who could be no more than 4′ 10″ tall in her most upright stance and seemed so fragile and meek in our embrace. She was pleasant and beautiful! As we talked, I kept thinking how I hope my skin would be as soft as hers when I’m 79 years old. Although she insisted that she couldn’t remember certain events, I thought Ruth had a terrific recollection of dates, names, and emotions. She explained that she knew little about Edward and Lucy because she did not spend much time with them as a child. One of the few memories she had of Lucy was staying with her on the day her mother gave birth to one of her younger sisters. She did, however, remember her first cousin Virginia, whose mother Clementine Mack was Lucy’s sister. I found this piece of information to be very helpful because now I know that Lucy was not an only child. I may begin to search for Clementine and Lucy to piece together my great-grandmother’s story. Ruth also shared that Clementine had three sons, one of whom worked on a cement truck. My mother also remembered this first cousin whom she claimed was an older man who occasionally visited her father (Henry) when she was a child. 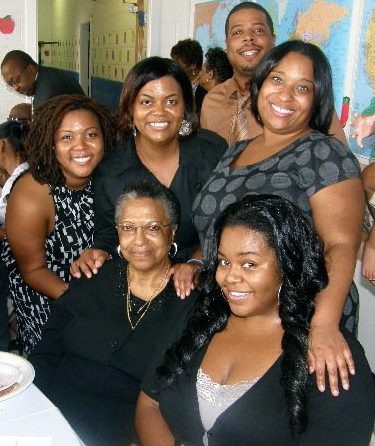 To my surprise, I not only learned a bit more about my ancestors but my mother and I enjoyed connecting with our living relative. We laughed hysterically at some of Ruth’s stories about her father’s strict rules, my great-uncle Floyd’s carefree lifestyle, and of course my disdain for laundry. After nearly 2 hours of storytelling, she invited me to visit again so that she could share more stories about my grandfather’s family and some of her photos. 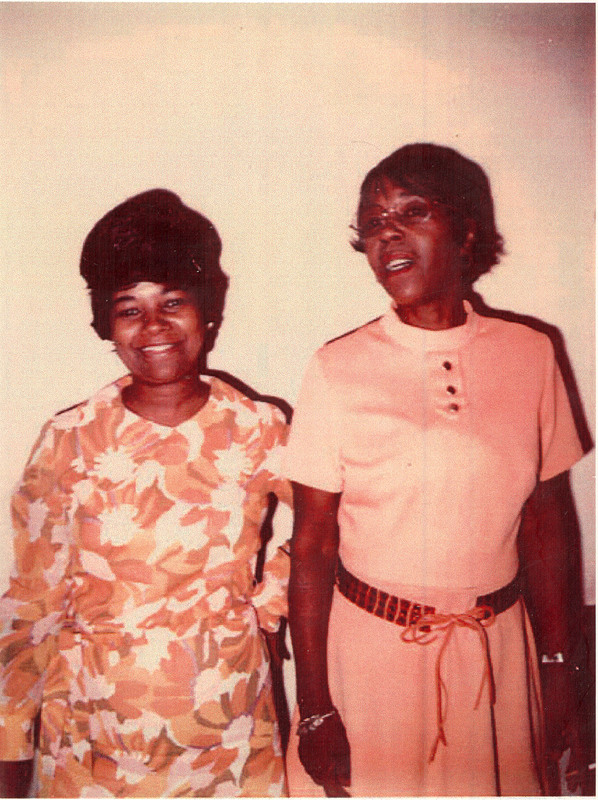 I gave her a copy of a photo (above) of her and my maternal grandmother, Mildred Bundy, taken in the 1960s. She was excited to share this with her grandson and great-grandson who were also present and tell us that the flowers in her dress were a deeper shade of brown than they appear in the photo. She said that those were good times. By the look in her eyes I could tell they were. In August, I joined my paternal relatives at the Hendrick/Mayo/Boyd/Harrison Family Reunion in Baltimore, MD. To my surprise, this event has occurred annually for the last three or four years. When I arrived at the park I was amazed by the outstanding number of people present and the diversity of the group. In age, appearance, speech, and education, our family demonstrated the breath and complexity of African American culture. It was incredible to look around and notice some relatives who appeared to have stepped out of an episode of “The Wire” and others a Ralph Lauren ad. And somehow, I seemed to fit in. My grandparents and the relatives of their generation had a funny way of explaining how these four families fit together. When I asked “How are we related?”, they simply replied “That’s family.” Eventually, I met a distant cousin who could provide a clear explanation of our ancestral ties. She explained that the families married into each other over several generations and all of them traced their roots back to Mecklenburg, VA.
My grandfather’s first cousin, Anna Lee, later explained that our extended family was very large and it would be easy to accidentally meet a Mayo, Harrison, Boyd, or Hendrick in Baltimore City. I thought – half jokingly – that as a single young woman I should get to know some of the older folks in the family to avoid dating a distant cousin. I scrolled through my mental Rolodex of single men in Baltimore and D.C. No Mayo, Harrison, Boyd or Hendrick…Whew! As relieved as I was, avoiding the romantic advances of a distant cousin, however, was only a minor motivation to begin this genealogical journey. My grandfather’s battle with cancer ended in September 2010. He would be the third of my grandparents to pass away. I was fortunate to have seen him during his last days. Although he was incoherent, I felt comforted in the thought that he knew my love for him. I have fond memories of my grandfather, but I still believe that I could have known him better in some ways. In fact, there was so much more that I could have learned about all of my grandparents and their families. Although I am thankful for the time I have spent with each of them, I feel compelled to document what I do know about their lives so that I may continue to learn from them. I hope that as I better understand them and their ancestors, I will learn a little more about myself.